We have way more info about Mass Effect: Andromeda thanks to the big N7 day info dump, but that naturally just leads us to even more questions. Fortunately, creative director Mac Walters has already dropped some wisdom on a variety of Andromeda topics via a rapid-fire video interview with Game Informer. Here are the biggest details from that interview. Everything's trilogies these days, but Walters doesn't see Andromeda as the start of a new one. That doesn't mean it will be a standalone game. For instance, it could have a single sequel, or four, or it could be the start of an anthology-style approach to Mass Effect storytelling. Here's some clarification from Walters' Twitter account. Walters gave a straight-up "no" to the question of whether your companion characters can die in Mass Effect: Andromeda. That's a massive, no pun intended, change for the series. The gut-wracking choice between saving Ashley or Kaidan in the original game was when it became super-clear that Mass Effect was taking this whole "choice and consequences" thing seriously. Not to mention the squadmate meat grinder that was Mass Effect 2's final mission. I'm hoping Walters just meant your companions can't die in the course of standard combat rather than during dramatic events, but we'll see. Yes, there are minerals and other materials to collect so you can craft new equipment, no, it won't boil down to slowly sliding a cursor across a planet. Walters said the mineral scanning in Mass: Effect Andromeda is "different from what you've seen before". Planet exploration is back via the Nomad rover vehicle, so it may be more like how it worked in the original Mass Effect where you found mineral nodes and marked them for extraction. You'll choose to play as either the son or daughter of Alec Ryder, but the whole Ryder family will still exist in the game no matter who you pick. And you'll be able to customize them however you like; the game doesn't force all the Ryders to have similar ethnicities. If you're wondering how that works, biologically speaking, here's a quick reminder that adoption is probably still a thing in the 22nd century. Some of my fondest memories from the original Mass Effect trilogy are of zooming in and out of the galaxy map, contemplating my next move and zoning out to the calming music. "We have a galaxy map but it's very different," Walters confirmed in the video. I'd expect it to be quite a bit more detailed - you are the new Pathfinder exploring undiscovered worlds, after all. No, Garrus won't be along to calibrate the Tempest's weapon arrays. Most of your squadmates will be long dead when the game begins in earnest, 600 years after the events of Mass Effect 2. 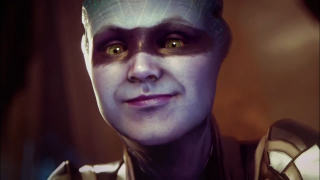 But at least one might still be around; Liara was only around 100 years old in the original trilogy and Asari can easily top 1,000 if they eat their space vegetables. Walters confirmed that there's no way to communicate with the Milky Way 'in this game', but who knows? With the Reaper threat ended by Shepard, the residents of the Milky Way have hopefully had several peaceful centuries to improve their communications technology. We might hear from Dr. T'soni again in the future. You don't choose a single class to define your combat approach when creating your character in Mass: Effect Andromeda. Instead, you can specialize in biotics, tech, or standard soldiery as you see fit. Once you get far enough along, you can unlock a class that will give you bonuses toward your preferred play style. Walter said there are "technically seven" of these, which leaves room for the original six classes plus the jack-of-all-trades Explorer.